On March 30 and 31, I went on a road trip down to Stuarts Draft with Elyse, where I showed her a whole bunch of stuff. 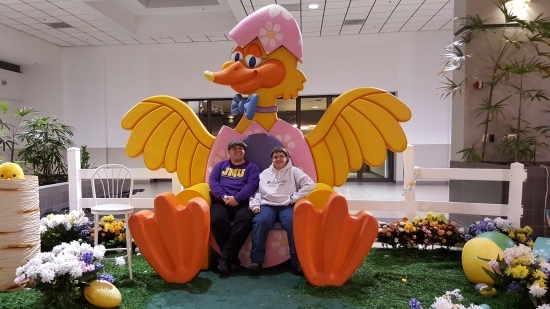 I showed her the mountain, we visited my ex-store, we went to Staunton Mall, and we saw JMU. All in all, a fun trip. The lesson to be learned from this trip, however, is that change is inevitable, as many things that I had hoped to show Elyse had changed, and other things were going to change. I do not know where this vintage television (an RCA XL-100) came from. I have a photo that shows the area where we found the television from November 2013, and it does not appear in those photos. 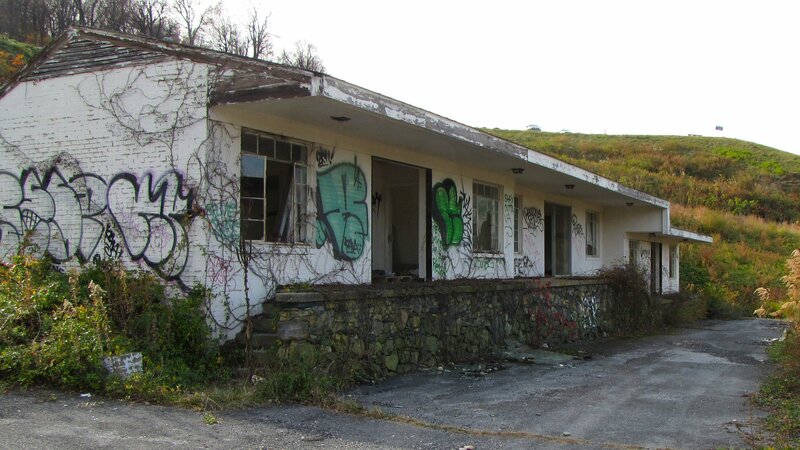 I don’t remember seeing it in any of the buildings from past visits, and in any case, it does not look very weathered, as one would expect it to look if it had been part of the motel complex and abandoned for decades. 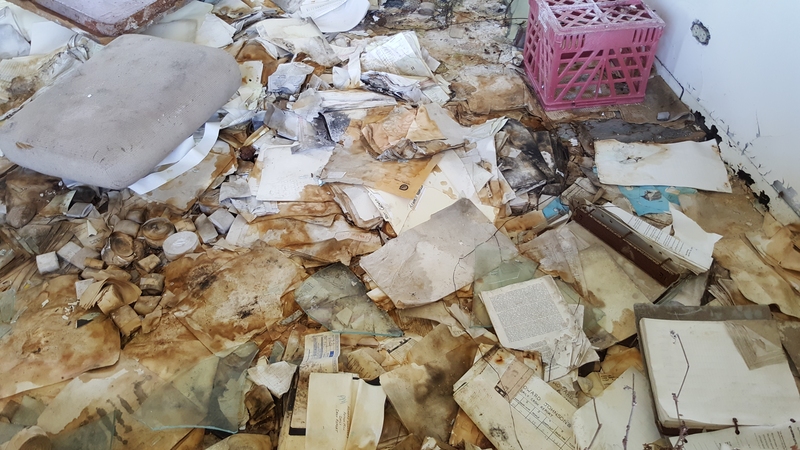 It is, however, possible that it was part of the barely-operating Inn at Afton property next door. 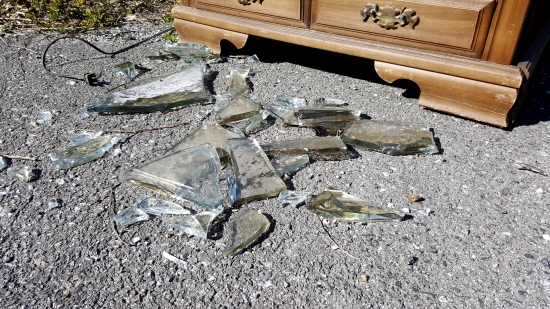 Considering that I have found other items in this area that were clearly ditched by people working for Phil Dulaney (the property owner), I cannot rule that out. 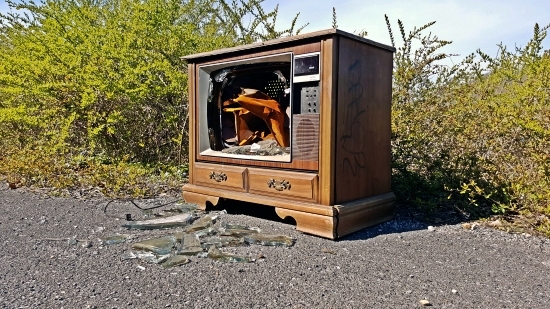 In any case, I find it somewhat strange that someone would ditch a television set here, but that seems to be the case. 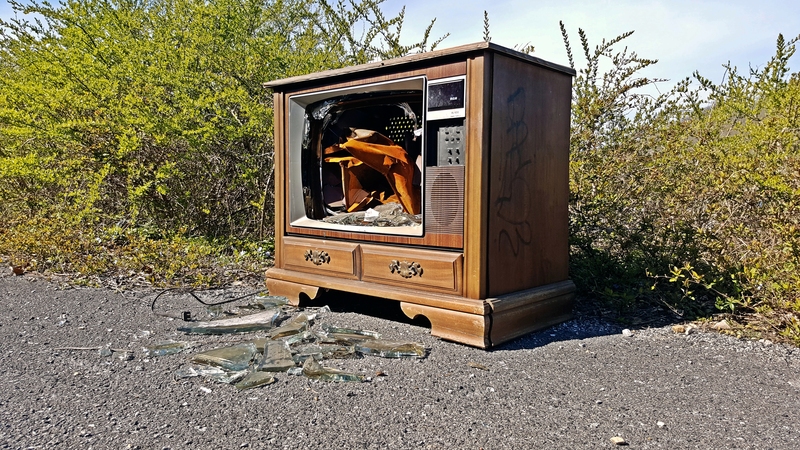 However, a quick search around the Internet reveals that people really will just ditch their unwanted items out in the woods or some other remote location. It’s not exactly the most responsible thing to do, but apparently, people do it. Apparently the television was ditched intact, and then the glass was broken on site, perhaps later on. In any case, I never really gave much thought to how thick the glass that makes a television is, but that’s kind of neat to see. These records will eventually deteriorate beyond recognition, but it will likely be many years before that happens. The art style vaguely reminded me of Matt Groening‘s Life in Hell comic. 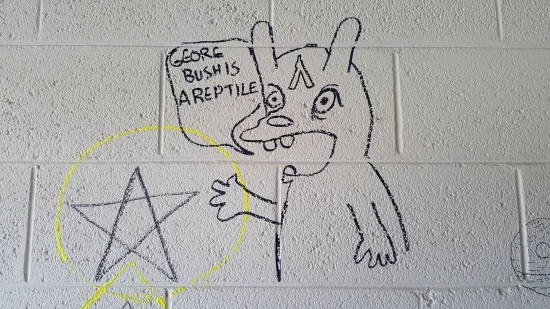 Then the text, “George Bush is a reptile”, reminded me of some graffiti that existed in the restroom at my old middle school for many years. That graffiti said, “Mrs. Byrd is a toad,” referring to a teacher there. I had that particular teacher back in 1994, and she didn’t seem like a toad to me, but who knows. In any case, that restroom graffiti was gone as of 2014. 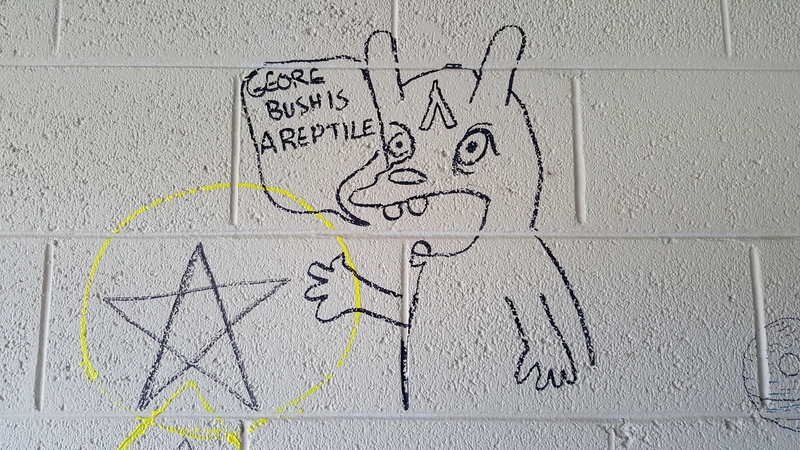 Regarding the George Bush graffiti, the Bush references make me think that this is an older illustration, and that I had just missed it on a few of my visits. That or someone still has a very strong opinion about George Bush. That looks safe… not. 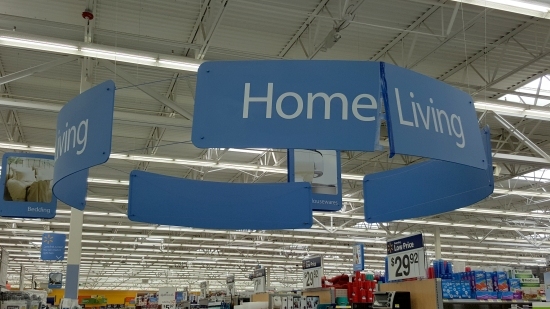 I liked the second version of Walmart’s “Project Impact” signage, but I’ve seen many instances where the larger signs have broken and had to be held together with tape and other things. This sign, however, looks like it could fall at any time. For my ex-store, where safety was always an inconvenience, this is not a surprise. Reminds me of the time when I caught a falling sign in 2005 at the same store. 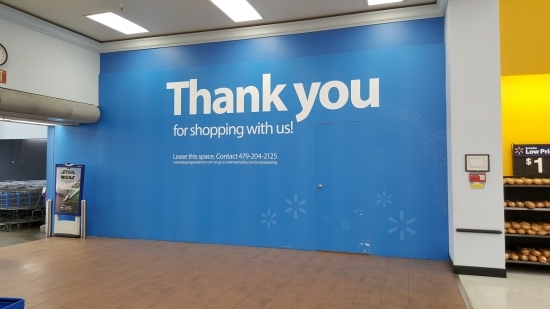 Hopefully this store will get updated again – thus removing the sign – before this sign finally gives out and hurts someone. Back in 2005 or so, we numbered the spill cleanup stations that were located throughout the store. They were numbered based on the departments that they were located in or near. 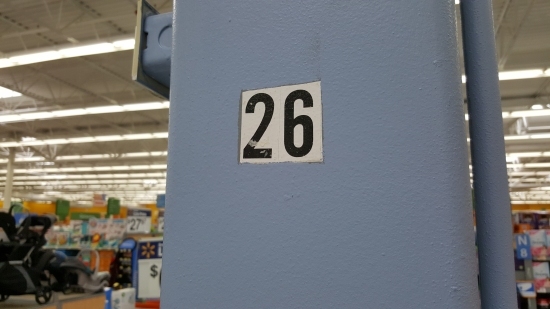 This one was located in the infants’ department, which is department 26. 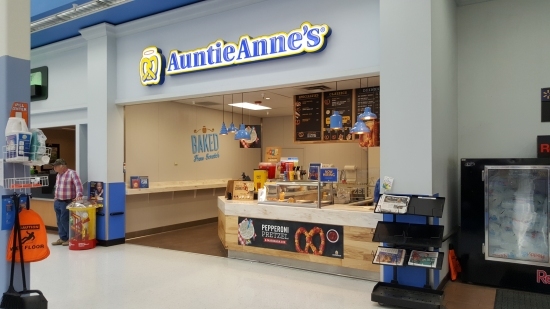 The spill station is gone now, and the infants’ department was moved to another location during the store’s 2010 remodel (pets is now in the original location). I am surprised that this survived the remodel. I would have expected that they would have either removed it, or simply painted over it. That they actually painted around it is surprising. The old portrait studio, which presumably closed when the entire PictureMe Portrait Studios chain went under, has now been replaced with an Auntie Anne’s. 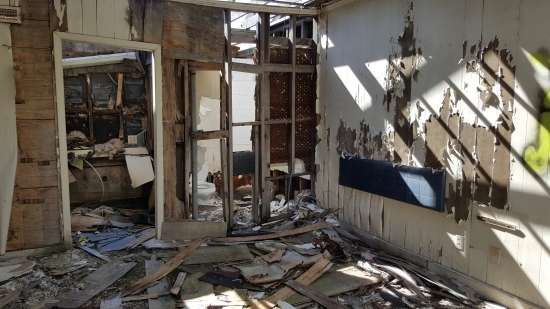 The McDonald’s, meanwhile, which closed in 2014 (and good riddance to them), is now walled off entirely, so it doesn’t look like an empty McDonald’s anymore. These smoke alarms had two problems: first, you’re supposed to replace your smoke alarms every ten years, and these had been in place for 23. 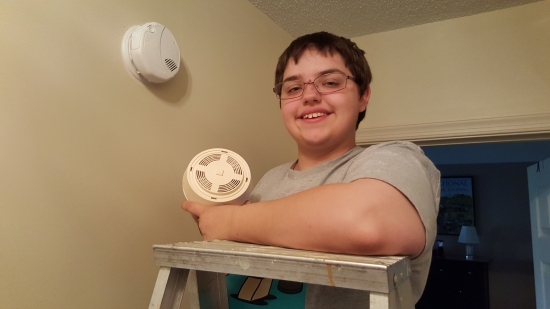 The other problem was that these smoke alarms had no battery backup. They were powered by house current, but if the power went out, so did the smoke alarms. 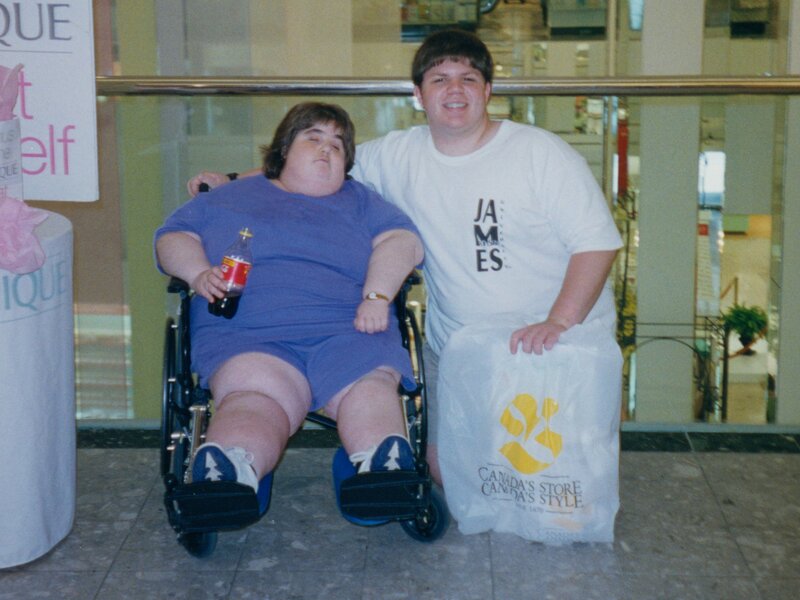 I had tried previously to get my parents to replace them in 2002, when the house was ten years old (i.e. time to replace them), but that led to a huge fight because my mother didn’t believe that replacing them was necessary, despite all of the literature, even back then, that said that you were supposed to do that. They ended up buying one replacement alarm (the house has two alarms) and never installing it because you needed to attach some wires. 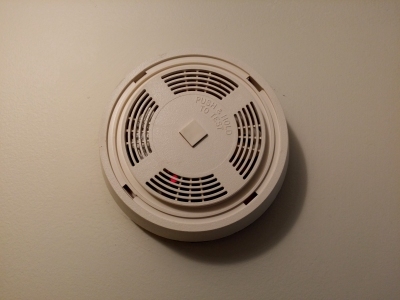 That replacement smoke alarm sat for years, and was eventually thrown away. Here, Elyse holds one of the old Dicon alarms, while the new BRK alarm is on the wall. And unlike the old Dicons, which sounded in continuous, these sound in Code-3, which is more or less the standard for fire alarms these days. 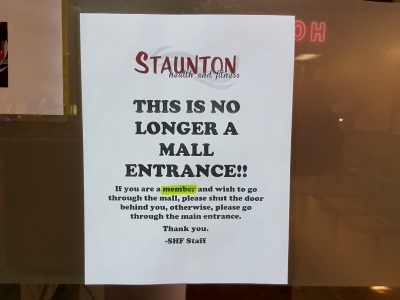 Then after dinner, Mom, Elyse, and I went to Staunton Mall. Mom had to get a few things, and I wanted to show Elyse a dead mall. In my almost 24 years of being acquainted with this mall, I don’t remember the place as ever being particularly vibrant, like the “real” shopping malls in Harrisonburg and Charlottesville. When we first moved to the area in 1992, it was still in its original form after having been enclosed in the 1980s. Back then, it had a black ceiling, relatively dim lighting, and a big fountain in front of the Woolworth’s entrance. Since then, the black ceiling tiles were replaced with white tiles, the lighting was increased, the fountain was removed and replaced by cheap linoleum, and Woolworth’s is long gone, with the space renovated and now housing a Peebles store. I have no idea when this ceiling damage happened. My guess is that it occurred during January’s blizzard, but I don’t know for sure. In any case, it is quite unsightly, and would definitely make me want to think twice about shopping there. They need to fix that. Further down the mall, I found that despite a change in names, some attitudes never change. Remember this sign from 2007, at the alleged mall entrance to Gold’s Gym? 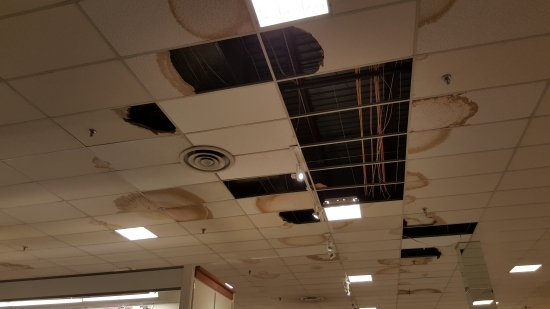 It seems to me that if they didn’t want to be part of the shopping mall, then they shouldn’t have located in a shopping mall in the first place. 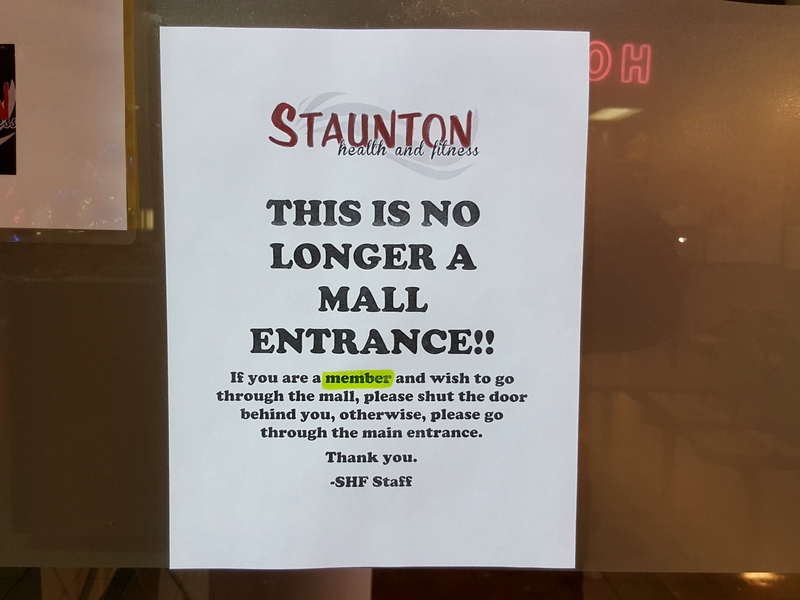 That sort of attitude really harms the mall, since it creates a separate facility inside a larger facility, and makes a big hole where an anchor store was supposed to have been. Staunton Mall also had a new source of life: a slot car racing facility. That store was pretty awesome, with lots of people hanging out and having fun. That was also the only store in the mall to have any sort of appreciable activity, with most stores being more or less empty. 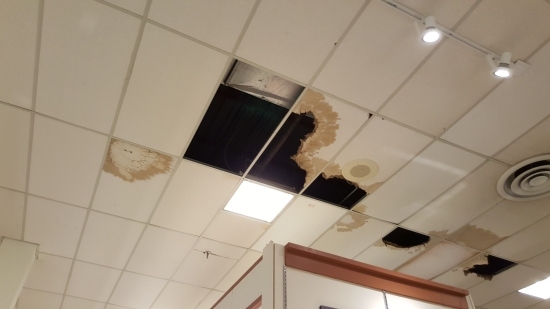 However, Belk recently invested in their Staunton store, with a new fire alarm system and better lighting, though the store had still not received a full remodel, i.e. still looking more or less like the 1980s inside. And that was our day. I’ll post about our visit to JMU separately.